Heat broiler, with rack set 4 inches from heat. Arrange chicken on a rimmed baking sheet lined with aluminum foil; rub with 1 tablespoon oil. Sprinkle with chili powder, and season with salt and pepper. Broil, without turning, until chicken is opaque throughout, 5 to 7 minutes. Remove from oven; set aside. On another rimmed baking sheet lined with foil, toss peppers, onion, garlic, and remaining tablespoon oil; season with salt and pepper. Broil, tossing occasionally, until vegetables are crisp-tender and slightly charred, 6 to 8 minutes. Meanwhile, thinly slice chicken crosswise. Stack and wrap tortillas in a damp paper towel; microwave on high until warm, about 1 minute. 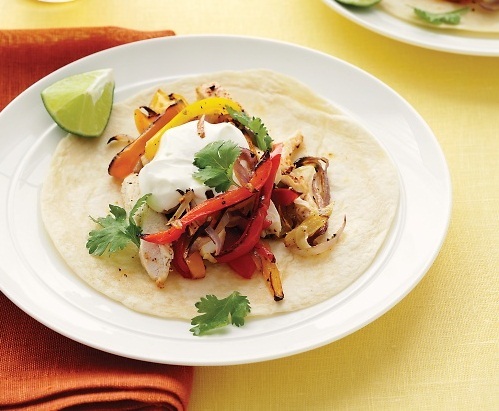 Transfer chicken and pepper mixture to a platter, and serve with tortillas, cilantro, sour cream, and lime wedges.